We would like to introduce ourselves and tell you a little about us. We are 2nd – 6th grade students in the after school computer class at Fremont Elementary. Our teacher’s name is Ms. Bright. Fremont Elementary is in the city of Bakersfield and the state of California. Our school has about 1,000 students. 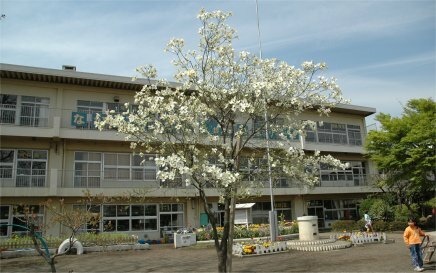 If you would like to learn more about our school you can visit our website. http://schools.bcsd.com/fremont/StudentPage.htm . We love learning about other people and places, so if you want to ask us questions you can email our class at bright@bcsd.com The monster part we would like to create is the tail. If that is already taken we would like the bellybutton or eyes. Hi to all of the other Monster schools! 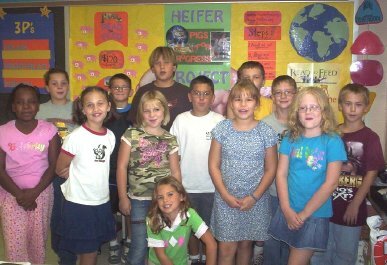 We are Mr. Smith's 4th grade at Eugene Field Elementary in Hannibal, Missouri. On the USA map you'll find us in the midwest region, located on the Mississippi River. Our school was named after Eugene Field, also known as The Children's Poet (he wrote Wynken Blynken, and Nod).There are 13 girls and 7 boys ready to make a great Monster this year. Curiosity is already high in our room -- what will the Monster look like this year????? Together, we'll all answer that question. Mrs. Dudding's 5th grade -- We are from Hannibal, MO like Mr. Smith. Eugene Field is located in the center of Hannibal. Most of our students live close by and walk to school. Many of their parents also went to EF. Everyone in our class of 17 (6 boys and 11 girls) worked on the Monster Project last year. We have been building monsters since Mr. Smith came to our school and really like to do them. The Kids wrote: We are a class of twelve fifth grade students from the Hannibal Public Schools and Holy Family Catholic School. The name of our class is LEAP, which stands for Logic, Enrichment, and Academic Pursuit. We meet at Eugene Field Elementary School one day a week where we exchange a canacopia of ideas and devour the educational opportunities placed before us. We'd like to do the eyes!! Greetings from The Child Development Center ! Our preschool is located on a college campus in Paramus,New Jersey. The children in our group are 3 & 4 years old. Our teacher is Miss Hope. We would love for you to visit our class at http://www.misshope.com/ . You can e-mail us at hjenning@bergen.edu . This will be our first time participating in the Monster Project .We are all really looking forward to it. Our parents are already saving recyclable materials for our monster making adventure! Two of the books we have been reading in our library corner are "The Soles of Your Feet" and "The Foot Book." We would love to describe the monster's foot or feet. If they are already taken.. Surprise us! We are the Pre-K class at the BCC Child Development Center in Paramus, NJ. Mr. Jack will be working with us to make a monster.You can visit us at www.misshope.com Since Miss Hope’s class is describing the feet; we thought we would choose the toes. We are very excited to work with everyone! We are Mr. Pittman's fourth grade class in Alexandria, Virginia. Our school, Hollin Meadows Science and Math Focus School, is less than 10 miles away from the White house in Washington DC. To learn more about our school, visit our school website: http://www.fcps.edu/HollinMeadowsES/ .To find out about our class, visit our class website, http://www.fcps.edu/HollinMeadowsES/pittman . This is our first year participating in the monster project, and we are very excited to meet all of you. If possible we would like to design the ears or nose. We are looking forward to making a monster for our school. Mrs. Floth's second graders have made a monster for many years. Our school is called J. Sterling Morton Elementary. Our school was named after J. Sterling Morton who started Arbor Day. His home is located in Nebraska City, Nebraska. Our school is located in Omaha, Nebraska. The second graders at our school work on Earth Day and Arbor Day projects and plant trees on our school property each year. You can see our school on www.mpsomaha.org We would like to describe the head of the monster. If that part is taken then the arms. Happy monster making! Our class wants to participate in this project. It's fun. We are third graders at Fuchinobe Elementary. Our choice is the body. 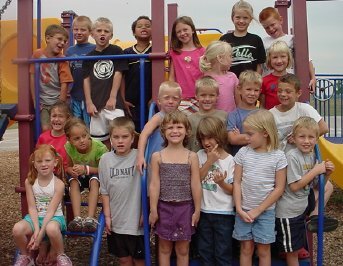 We are a class of first graders in the town of Pella, Iowa. If you have heard of Pella Windows, well they are made here. We are predominantly a Dutch community and if you visited you would notice the Dutch architecture of our business buildings and the largest working windmill. We have 23 children in our class, 12 boys and 11 girls. Our teacher's class has made a monster each year since this project began. It is great fun. 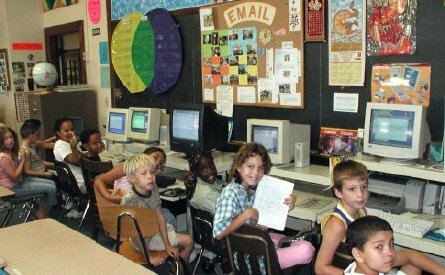 We are first graders at Elmwood Franklin School in Buffalo, New York. 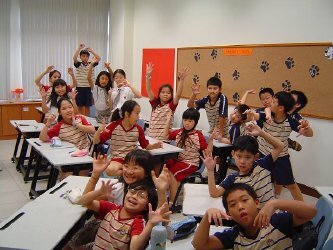 We want you to know that our school is a very big school with 374 students. There are 42 kids in first grade. We have a fun and busy day. We have a great playground. We have gym everyday. We are excited about the monster project. It sounds like a lot of fun!!! We are enclosing our picture. Here is a project which we have enjoyed using with our monster project. We do not know who first thought of it, but we have used it for many years. 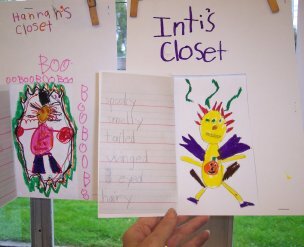 First, we read the book There's A Nightmare in my Closet by Mercer Mayer.Then we brainstorm a long list of adjectives that could describe a monster in a closet and write them on chart paper. Teachers have prepared paper closets in advance, which consist of one white paper with a door cut on two sides, stapled over a whole sheet of white paper. We use standard 8 by 12 construction paper. 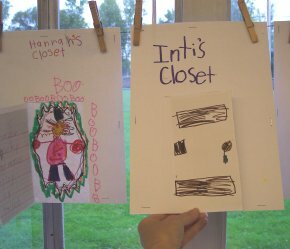 Students choose seven adjectives to copy on a sheet of handwriting paper which is cut to fit and be glued on the inside of the door. 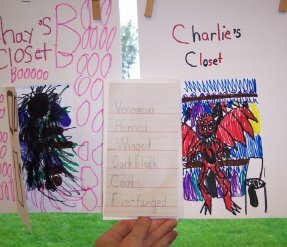 Then students draw the monster on the paper behind the paper door, using all the adjectives chosen. 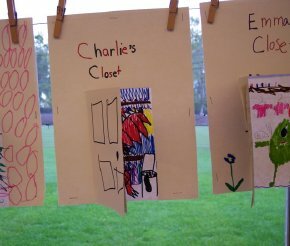 They print "BOB"S (student's name) CLOSET" on the front of the white paper and decorate the outside of the door. The children love this and although it does involve a fair amount of teacher preparation, it is really worth the results! I'm attaching some photographs to help clarify my directions. 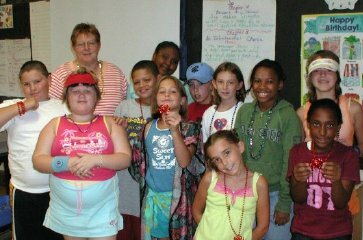 We are a fourth grade class in McConnellsburg, PA. 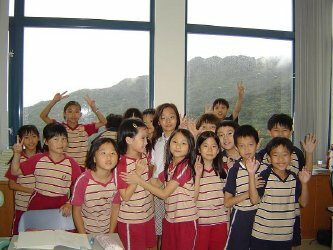 There are 15 children in our class--8 girls and 7 boys. We are reading to raise money for "Read to Feed". We have 5 monarch chrysalis. Earlier 2 emerged and we released them. We are getting fish for our aquarium to study systems. We have a worm farm in which the worms eat garbage and enrich the soil. We are a nice class who learns a lot. Would any classlike to be our pen pals? Hello from Mrs. Felty's Kindergartners! Our school is Park Village Elementary in San Antonio, Texas. We have 18 students in our class. There are 9 boys and 9 girls. We enjoy going to literacy centers and math tubs. Our favorite book right now is Mary Wore Her Red Dress. We like to sing it and write about it. Our favorite math activities are building with geoblocks, multilinks, and Mr. Potato Head. We also like to work together making ABC and number floor puzzles and reading them with pointers. We are looking forward to reading spooky stories and building our monster with our 5th grade reading buddies. written by Jessica and Sherry in Grade 4.